the need for Singapore to attract more educated immigrants. who have studied or worked in the US and Europe. to replace our population," said MM Lee. flourished and taken root in the country. Mr Lee gave an example of how one immigrant is making a difference. Service Commission," said the Minister Mentor. 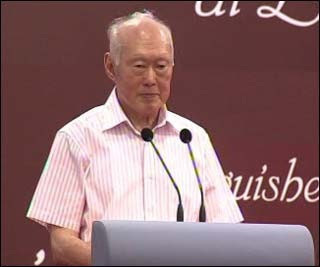 inspire the next generation of Singaporeans," he said. Their presence has also helped to shape the Singapore landscape. example of how integration can be done. We have more than enough native educated Singaporeans! These FT are like the Romania ambassador. When they need you, they will sing how good SIN is but when they are going off they will bad mouth SIN until like they were forced to stay in SIN city. I think the govt seriously do not know what is happening on the ground. Do we really need those normal educated FT? the unhappiness on the ground is real. i already felt it when i was doing my ns. back in the 90s, people talked alot, made noise, but i never got the feeling they were unhappy. but around the late 2000s, things changed. people talked, and they were starting to get genuinely unhappy. they started citing examples of unhappiness, something which was not done previously. i had many of my guys in ns coming to me asking why they are forced to slog so much in ns out in the field when many others did not, and new citizens did not need to. frankly i had no good answer to them, and today i still have no good answer. and now the guys have largely grown up---and what are they thinking of nowadays? obviously the FTs here are not educated enuf...we need MORE!!?? for sure, to become stooges for your PAP, Mr Lee. Isn't it the truth Mr Lee, it's getting harder and harder to find educated Sporeans with 'real talent' to become stooges ? Did'nt Walter Woon quit on your system Mr Lee ?